The Good Garage Scheme presented a set of wireless microphones as a gift to the Coventry day care centre of BEN the automotive industry charity at the end of last month. They have also helped in raising the charity’s profile via their social media outlets. With over 3,000 member garages, and tens of thousands of website hits each month, the Good Garage Scheme has proven a valuable channel for BEN to make itself known. 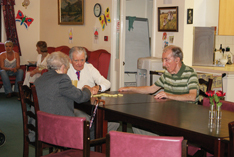 Funds were raised in July to buy the day centre their chosen donation through an office summer beach party as part of National BEN week. 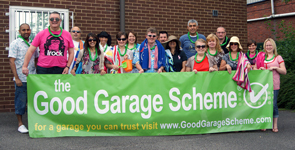 It involved staff at the Good Garage Scheme Head Office dressing up in beach clothes and having a picnic lunch. BEN is the UK’s only dedicated charity that helps those who work or have worked in the automotive industries. The Good Garage Scheme are keen to support the positive work they do which encompasses a variety of practical methods such as support, financial and emotional advice and care centres to better the lives of those in their care.